Originally from Taiwan, JULIA HSU was awarded governmental music scholarships to study at The Purcell School for young musicians at the age of 14 with Professor Patsy Toh, wife of renowned pianist Fou Tsong. She continued her studies at the Royal Academy of Music, London, where she completed her Bachelors and Masters degrees in Piano Performance with distinction. She went to Helsinki as an exchange student in the winter of 2006 to study at the Sibelius Academy, where she benefited greatly from the guidance of Professor Matti Raekallio, whom she then later followed in Germany, at the Hannover Hochschule für Musik und Theatre, in the highly sought-after Soloklasse programme. Julia has lived in London and Berlin, and besides her dedication to being a classical musician, is passionate about modern theater and visual arts. Past collaborations include exhibitions and performances with photographer Roman Schramm, sculptor Hella Gerlach and modern dance choreographer Shang Chi Sun, with whom she performed in Festival d'Avignon OFF, France; and Tel Aviv's annual Dance Festival at the Suzanne Dellal Centre, Israel. Earlier in 2013, Julia was appointed Musician-in-Residence in Yilans Rudolf Steiner School, Taiwan, where she interacted with students and fellow colleagues through regular lecture recitals and various chamber music projects. 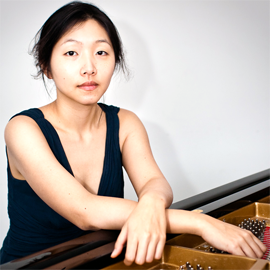 Julia has been a Collaborative Piano Fellow at Bard College since 2013.